This book was assigned for Eric Waggoner’s seminar on “prose technique” at this week’s residency. By the time this review posts, the seminar will have happened, but I’m writing beforehand. This review is time-traveling to the future. 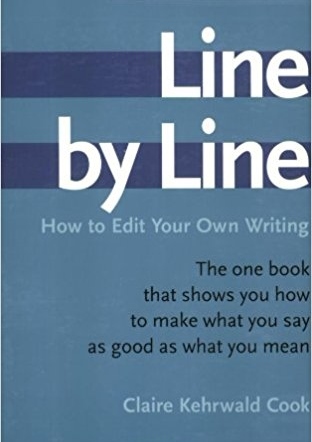 Line by Line is a handy reference tool, but no kind of book to read cover-to-cover, and I’m a bit surprised that Eric assigned it as he did. I read the preface and flipped through the rest, interested to see how it handled, for example, the singular “they” pronoun as used by people who don’t ascribe to the gender binary, including a few of my favorite classmates (much discussion of the problem of “he” versus “he or she” versus a singular “they,” but no direct address of the binary-gender problem itself). I skimmed for examples (mostly colorful ones, and from real writing found in real life). It’s got a decent glossary of questionable usage (like affect/effect), although I was surprised to see “hopefully” included (should mean “in a hopeful manner,” rather than “it is hoped that”) and not “momentarily” (the same strict grammarians, I believe, would reserve this for “taking place for only a moment,” and not for something to happen just a mere moment in the future). Which just goes to show that any book like this can only do part of the job, and only from one grammarian’s perspective–obviously. On the one hand, then, why try? No, we do need books like this. But we need to know they are only ever a starting point. As for readability, why on earth Line by Line when we have Strunk & White’s Elements of Style?? “Omit needless words,” they famously wrote; and that perfect sentence is oft repeated but not always obeyed. My favorite part of Strunk & White’s “little book” is how pleasant it is to read, cover to cover. This one, I will keep handy for consultation, especially for Eric’s seminar, but it will never win my heart like that other one did.